JC: What is your current position? I am a SSHRC postdoctoral fellow in the Department of History and Classics at the University of Alberta. I completed a PhD in Geography at the University of British Columbia. JC: I understand you recently published a book in the Nature | History | Society series at UBC Press. Could you describe this project? As many people will know, southern Manitoba is often threatened by flooding. Wet Prairie: People, Land and Water in Agricultural Manitoba(2011) is an examination of surface water management in the agricultural regions of southern Manitoba. Due to the Canadian federal government’s inflexible settlement system as much as to the local environment, many newcomers who intended to farm shared the experience of finding themselves confronted with flooded lands. In a bid to reconcile agriculture and surface water, and in keeping with the liberal tradition of facilitating economic development, the provincial government undertook substantial drainage efforts. Water-flow patterns, whether altered by drainage or not, became the subject of intense, long-running debate among provincial officials, drainage experts, and Manitoba residents. The book seeks to explain patterns of engagement between people, government, and environment over a long period stretching from 19th century efforts to drain the Manitoba landscape to late 20th century attempts to establish watershed management. New alliances and rivalries emerged amidst shifting social, political and environmental contexts, with enduring consequences for both the landscapes and people of the wet prairie. JC: Are you working on something new? I’m researching the Prairie Farm Rehabilitation Administration [PFRA], a federal agency created in 1935 in response to the drought and depression afflicting the agricultural regions of the Canadian prairies. Until 1969, the PFRA operated within the federal government’s Department of Agriculture. Through a historical perspective on the PFRA’s first 34 years, this project examines the role of the PFRA in facilitating the transformation of prairie agriculture. I anticipate the project will culminate in a monograph in which I will argue the PFRA in this period be understood as a low modernist agency. The term ‘low modernist’ was coined by rural sociologist Jess Gilbert as a counterpoint to anthropologist James Scott’s influential concept of high modernism. In his widely-cited Seeing Like a State: How Certain Schemes to Improve the Human Condition Have Failed, Scott explains the role of a high modernist ideology, defined as an over-reaching confidence in scientific progress, the mastery of nature, and the management of humanity, in the failure of many 20th century state-led attempts at human improvement. In his analysis of the actions of United States farm officials in the years of the American New Deal, Jess Gilbert find something wholly different from high modernism: a set of positive encounters between agents and agriculturalists that, for a time, supported farmers in their own efforts to adjust to change in agriculture. I will argue that out of the drought and depression of the 1930s, through the shifts in agricultural practices and markets that continued through the mid-twentieth century, the PFRA embodied many of the principles of low modernism. The monograph will also address a profound irony: it was the PFRA, through its low modernist practices, that facilitated the entry of prairie farmers into the world of globalized, chemical-dependent, large-scale farming — an agricultural mode vulnerable to the sort of catastrophic failure documented by James Scott in Seeing Like a State. As I go through historical materials related to the PFRA, I’m also collecting information related to another project, one that remains quite preliminary at this point. I’m interested in the idea of development as conceptualized and deployed by Canadian federal and provincial governments in the mid to late decades of the 20th century. As I believe the PFRA played a key role in defining development, I’m finding quite a bit of relevant material in my current research. At this point, I anticipate this later project will consider how Canadian development agencies dealt with people and places considered to be underdeveloped, such as certain rural regions and many Aboriginal communities. I’m also interested in making a connection between domestic and international efforts at development. Indeed, the project is in part an effort to figure out just what the PFRA was doing in Ghana in the 1960s and 1970s. JC: Are there any major themes or emphases uniting your past, present, and future projects? I use historical methods to study past efforts at government planning, with a particular focus on plans with environmental aspects. From drainage districts and watershed conservation districts in Manitoba, through the Prairie Farm Rehabilitation Administration, to the 1960s and 1970s concept of development as it played out on national and international scales, I am interested in how people have worked together through government authority to address perceived problems, whether human or environmental. I’m interested in the outcomes, both positive and negative, of these efforts. Who benefited? Who didn’t? What were the consequences for people and places? 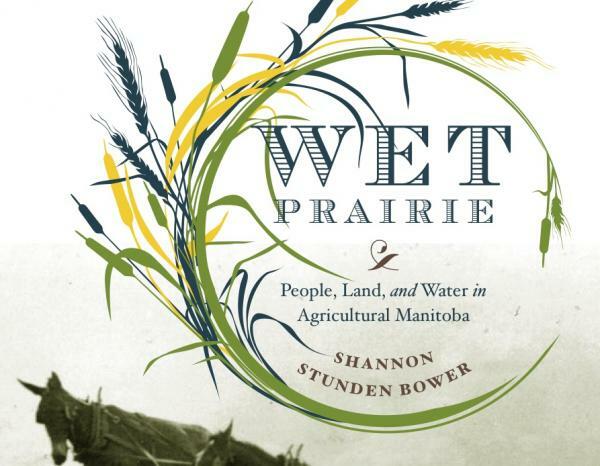 JC: You can order a copy of the hard cover of Wet Prairie: People, Land and Water in Agricultural Manitoba from the UBC Press website.